Took a flying visit to Tasnarnia at the weekend to see about some more dental work. This may seem a little extreme, unless you appreciate my pathological suspicion of the dental profession developed from a species of practical aversion therapy (common to many people 35 and older who remember when dentists used to hurt). I trust Dr W with the kind of fierce loyalty born of a lifetime of distrust. Anyway, dentist aside, it was a lovely weekend. Caught up with just enough familiar faces (but not too many). The winter in Slobart was, if no better, then certainly no worse than Can’tberra – clear skies, relatively mild days. Just enough to get you rugged up without being bogged down by excessive layers. Talking about layers, though, there was something new that I hadn’t seen in Slobart before. 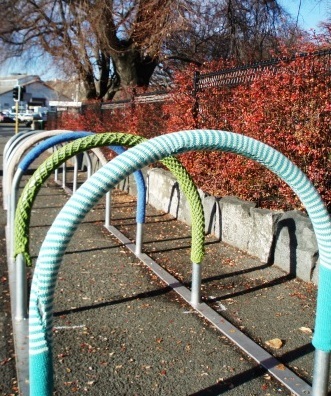 I turned a corner near Parliament House, and there were these bike racks – clothed for winter. Some canny knitter had dressed the steel semicircles with a kind of legwarmer. Rackwarmer. Pipewarmer? The mind boggles. As you can see the knitting is of pretty reasonable quality – involving patterns and alternating colours – and all neatly sown in place. But no sign of who perpetrated the act, or why. Just down the road the guerrilla knitters had struck again. 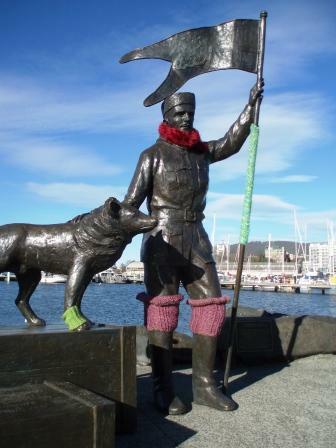 This time they’d taken to the statue of Douglas Mawson and his dogs at Constitution Dock. Again, all the pieces were made to fit and sown in place neatly. The pink legwarmers are a joy. And the dogs were not forgotten; one had matching legwarmers, the other a vest. In fact, one wonders whether if Sir Doug had been rigged up with this gear perhaps he wouldn’t have been reduced to making a meal of the huskies quite so early on. Bad thought, must scratch out later. Apparantly there was some press speculation about a week ago that it could have been part of the Midwinter Festival, but festival organisers were reportedly as bemused as anyone. So the pretty statements remain, a colourful amalgam of dagginess and subversion but, like so much graffiti, a mystery to passers-by. 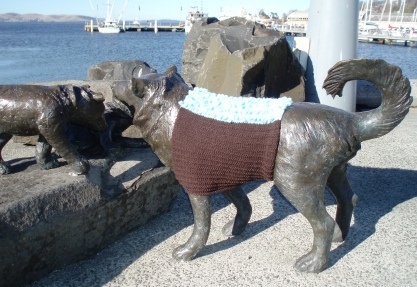 The guerrilla knitters roam free and anonymous – for now. Well hello! Good of you to visit. I’ve arrived at what the fly-in, fly-out contingent refer to as ONC – Our National Capital. The national Capital of Oz. For the locals of course it’s just home. Which it is for me now, too. My new home looked pretty ugly for a few days. I thought my workplace was in a particularly shabby part of town. Don’t these people look after their gardens? Eventually it dawned on me that this is what a garden city looks like in the middle of winter and a long drought. Dead grass, dead trees, empty garden beds. I was looking with my Tasnarnia eyes – Slobart is one of the rare towns where “sprinkler” is not yet a dirty word. Now, several weeks later, I see the sparse beauty I learned to love in the Northern Tablelands. My first long weekend in the Berra was educative. A designated fireworks weekend, this year their sale and permitted detonation times were drastically curtailed. The government threatened revellers to behave or lose future fireworks priviledges. On the Thursday a multitude of temporary stalls appeared in vacant shop fronts adorned with fluro FIREWORKS HERE signs. And business must have been brisk because despite the restrictions there ended up being an increase in complaints, lost dogs and vandalism. Which goes to prove that not everyone in ONC is clever. Being temporarily housed on the ninth floor of a hotel, I gave explosives a miss this year in favour of something more cultural. 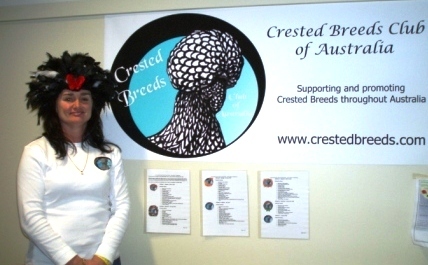 With so much top drawer culture to choose from in the Berra, what got my vote? Was it the final days of the NGA’s Turner To Monet (known in the Berra lexicon as Tuna Mornay)? Humour in Hansard at Old Parliament House? Max Dupain photos at the Australian War Memorial? 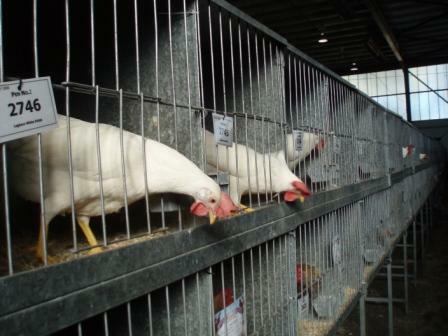 You’ll be pleased and proud to know that I opted for the National Poultry Show at the showgrounds. Yep, chooks. Thouands of chooks. And some ducks and geese. And a whole lot of galahs looking at them. Billed as the ‘Chook Olympics’ because it happens only every four years, it more greatly resembled a Miss Australia for fowl, with the added atmosphere of a battery. If you’ve never been to a chicken battery before, I recommend it. You may not stop eating the things, but you may think twice about free range options – not just for the sake of the chooks, but also for your plate. 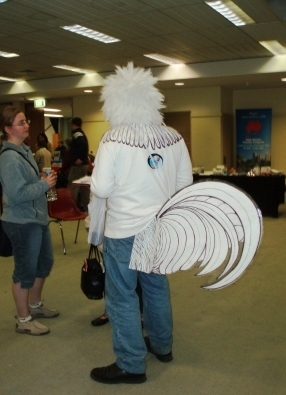 Anyway, after cruising the stalls where strangely attired folk spruiked membership to specialist poultry fanciers groups, and dodging the auction room where birds were exchanging for thousands of dollars, I made it to the main exhibition hall. And was nearly knocked flat by the stench. Peering into the murky natural light of the enormous concrete-floored hangar I discerned a wall of chickens displayed in little cages stacked three high and about 100 across, as far as I could see. With a last gasp of fresh air, I plunged in. As long as I kept my nose blocked, it was interesting. Who knew there were so many varieties? So many colours, combs, and feathers in strange places? As I walked the aisles, my enthusiasm dimmed a little. 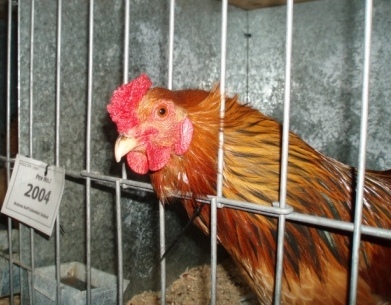 The first chickens were fine examples of the sorts we all know – white leghorns, rhode island reds and so on. The next ones were similar, but with prettier plumage. 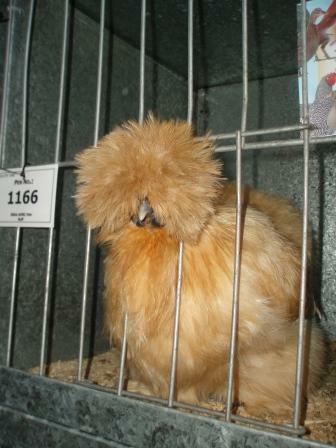 Then the plumage got a bit weird – like feathered feet – and then it started to get out of hand. 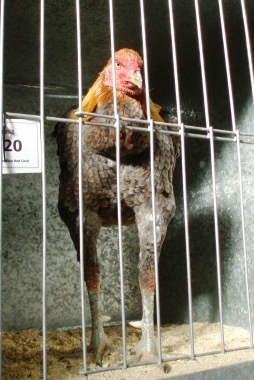 Finally I rounded a corner and found someone had replaced the chickens with monsters. Huge, scaly long-legged beasts with lean bodies, sparse feathers, bright eyes and sharp beaks. These things were scary. One of the chooks appeared to be hypnotising a woman; she eventually tore her gaze away and turned to me. “Prehistoric, aren’t they,” she said. It wasn’t a question. “It’d be helping you,” she replied. I’ve decided I no longer want chooks. Or geese, for that matter. 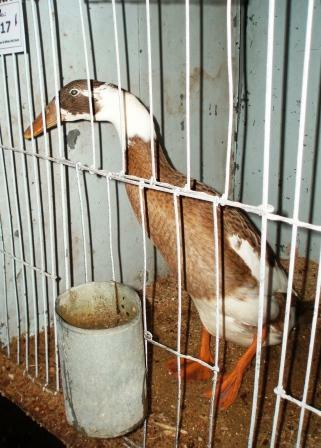 Their beaks were serrated, like they have residual teeth. That, together with the hissing, and I wasn’t convinced I wouldn’t be harbouring a creature ready to erupt into full T-rex slaughterhouse mode come the next full moon. No, it’s the ducks that are for me. Their soft voices and quizzical expressions were captivating. Give me a little flock of Indian runner ducks to populate my backyard, and I’d be happy.